Just what was that annoying kid yelling in his strident Scottish accent? You’ve already shouted good morning to your friend once, twice, and more, how many times do you have to shout to him, why don’t you just shut-up? And so, I drifted back off into another dreamy slumber in my cosy sleeping bag on the airbed on the floor of the caravan. I was fifteen years old and like most teenage boys couldn’t or wouldn’t get out of bed in the morning, particularly as one was supposed to be on holiday. But that pesky annoying boy was still yelling outside as I drifted in and out of my early morning teenage consciousness. Of course, he was a paperboy, and his morning salutation was not a rowdy greeting to a friend, but an invitation to all and sundry to purchase a morning paper! In my semi-comatose state I remember mentioning something stupid like why didn’t he stop yelling for David, and then being laughed at; I should have put two and two together as the same piercing voice was alternately yelling Daily Record, the title of a popular Scottish newspaper of the era. We were on a family holiday in Scotland, the year was 1964. My parents had recently purchased an elderly Sprite 14 caravan which slept four, my parents had the large double at the rear and my brother and sister had the longitudinal seats either side of the dining table. They were not adult-length beds as, with the table collapsed, a double was formed crosswise in the front end of the van. For our purposes though we didn’t construct the double, my younger siblings slept on the short benches and I slept on an airbed at floor level in the middle of them; it was cosy down there, hemmed in by the walls of the under-seat storage lockers. It was a touring holiday and we usually only spent a night or two at each stop, mostly in Caravan Club certified locations in isolated places, but occasionally we stayed at larger sites such as at Oban where the annoying paper boy did his early morning calls. 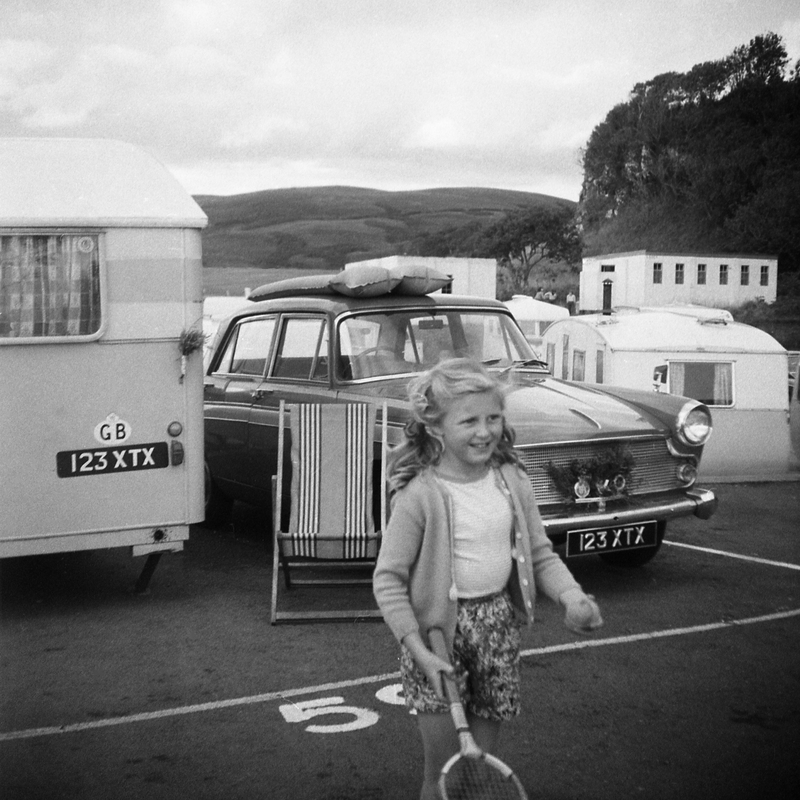 I had my Purma camera with me and did take a few photographs and this shot shows my sister with a tennis racquet at the Oban caravan site. Our Austin A60 easily towed that ungainly caravan all round Scotland; you will notice the heather tied to the caravan corner handle and the grill of the car, this was a tourist thing, every car and van seemed to do it and we just followed suit, goodness knows why? We didn’t stay long at Oban, it was too busy and cramped as you can see, each caravan and car allocated a small space on hard-standing. Where we went from there though, I have no idea as I can identify very few of the locations from the photographs my father and I took during that holiday. I used to hate caravan holidays when I was a boy. Being the eldest I always got the lilo on the floor with the inherent risk that someone would stand on your head in the middle of the night. Oh it wasn’t so bad down on the floor, it was cosy and being the last usually to go to bed I was left undisturbed.